The Russian Federation annually celebrates one of the important public holidays, Flag Day, on August 22. This holiday was established to commemorate the day, when the present-day flag of the state was risen over the Russian Supreme Soviet building after a 1991 coup d'état attempt. The coup attempt was made by a group of members of the Soviet Union's government in order to take control over the country and depose then-President Mikhail Gorbachev. The coup was suppressed in two days and President returned to the government. These events destabilized the Soviet Union and contributed to both the demise of the Communist Party of the Soviet Union, and dissolution of the Soviet Union itself. 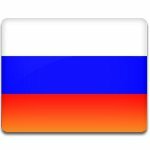 Present-day flag of Russian federation consists of three colors: white on the top, blue in the middle and red on the bottom. This flag was first used in 1696, but during the Soviet regime it was substituted. There is no special or official meaning of the colors used for the flag. Mostly white is associated with the nobility, blue with honesty and red with love or courage.